We bought a ping pong table online and it was delivered on a double pallet. I guess you know what that means. Time to make a pallet potting table, right? I was out of town when it arrived but being the good husband, Barry saved the pallet. He said I knew you’d want to do something with it. It didn’t take me long to come up with an idea. 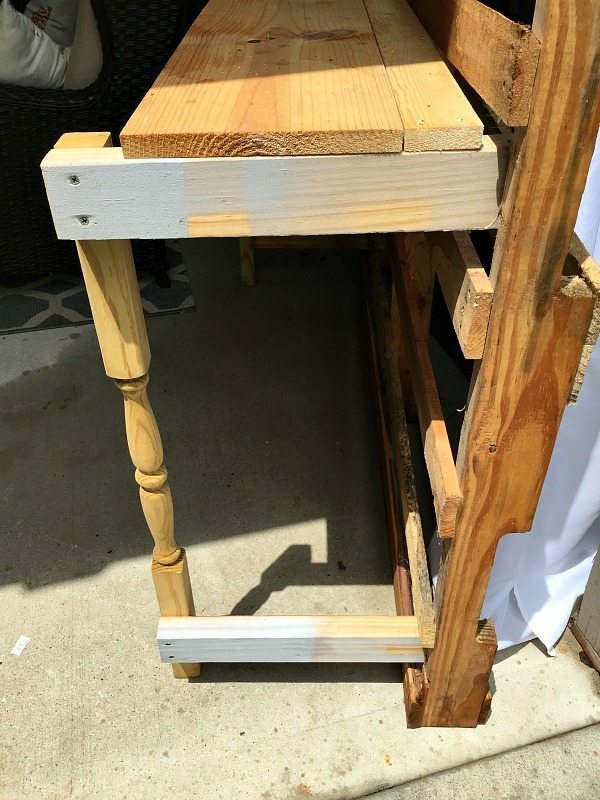 I searched our scrap wood pile to gather anything that looked like I could use it to create the table part of the potting bench. I did have to buy a couple of 1″x4″ boards. I put it all together with this and that and a few screws. Turned it over and used my paint sprayer and painted every inch of it with 3 partial cans of various gray chalk paints. Stencil – this part surprised me a little too. 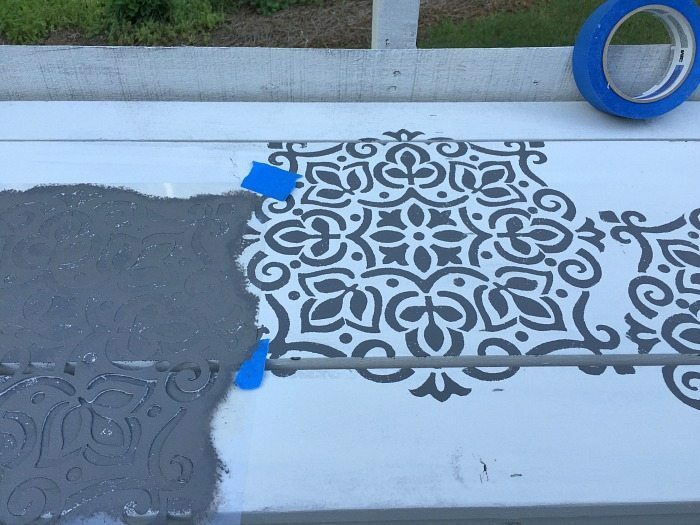 One day I was browsing the craft isle at Walmart and I found this Waverly stencil and it reminded me of the popular concrete tiles (that I have fallen in love with and want to rip one of my bathrooms apart just to use it) until then, I will just try to create the look on top of my rustic farmhouse pallet potting bench. 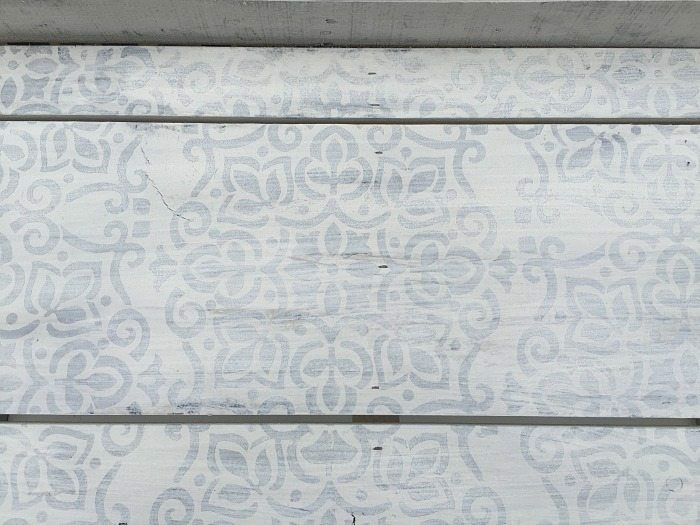 The stencil was complete and I decided to tone it down, give it a distressed look by brushing on another new product that I just discovered, white stain. It turned out perfect, well imperfect, which was what I wanted. 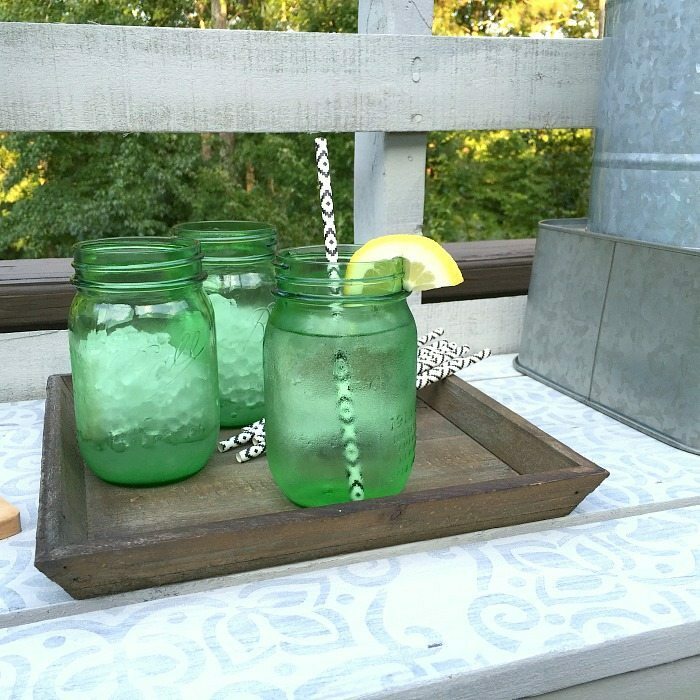 Perfect for parties or potting plants. I found these perfect baskets at the At Home store. 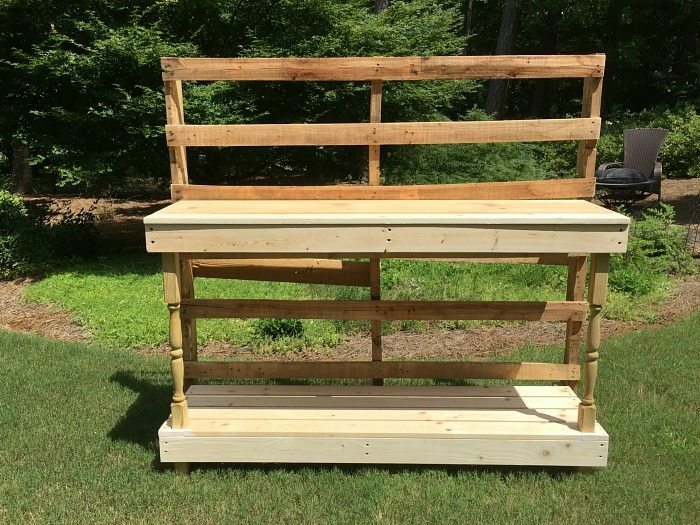 Making lemonade out of lemons and potting benches out of free pallets. 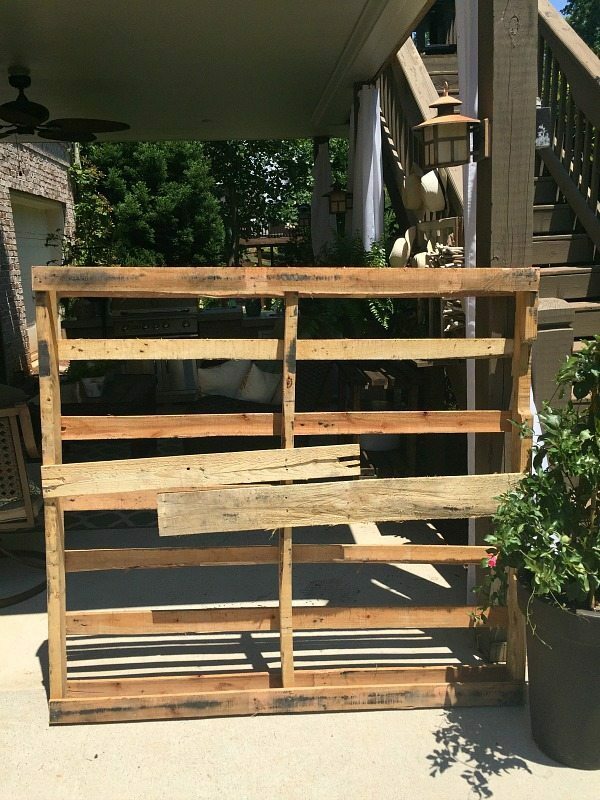 What pallet projects have you created or want to create?? In other unrelated news, I try to plant sweet potato vines every year and they never disappoint. I have to water these every single day! 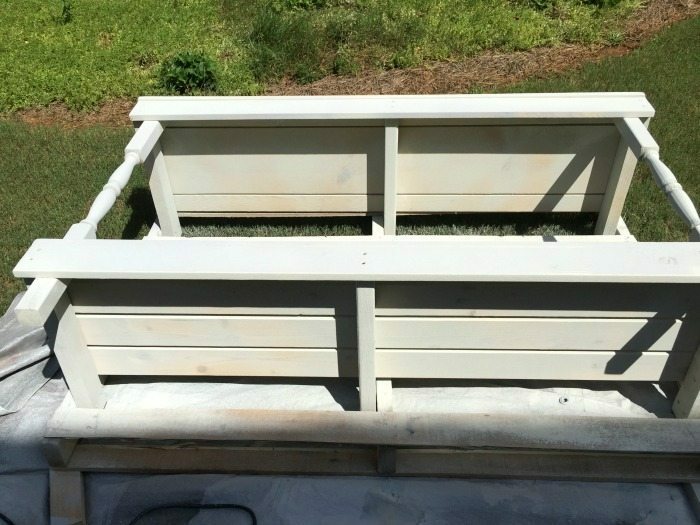 I love the potting bench, you did a great job on it! 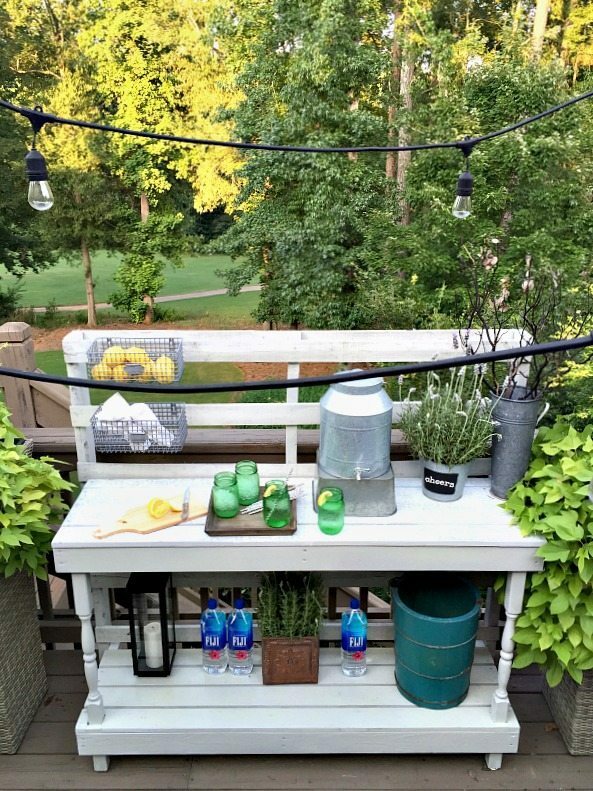 Perfect for parties, or potting. Really like the stencil you added. Very pretty! Love how it turned out! 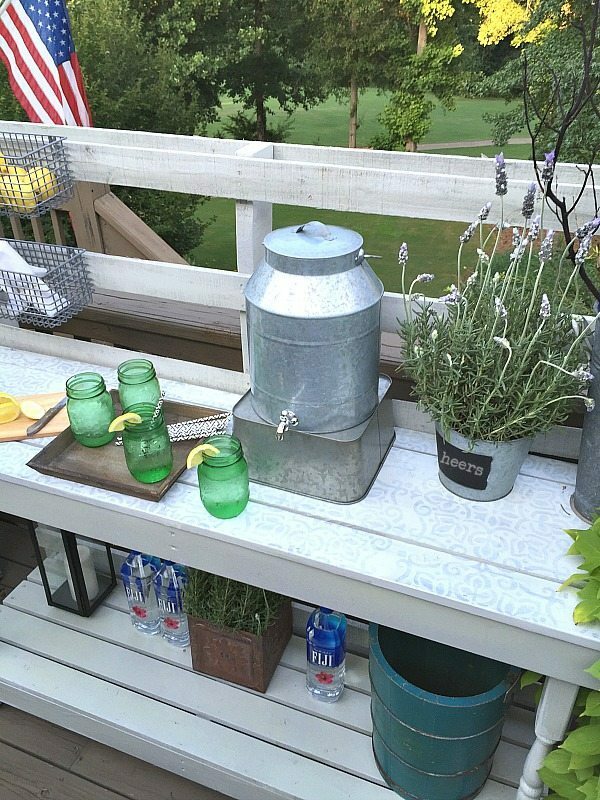 It would also be great inside as a craft table. Oh my goodness, that is a great idea! 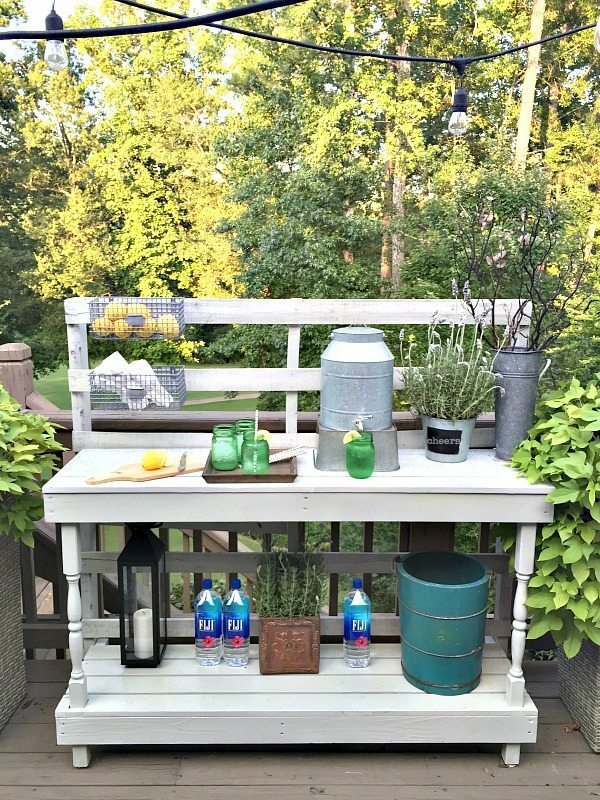 Love your potting/beverage bench! 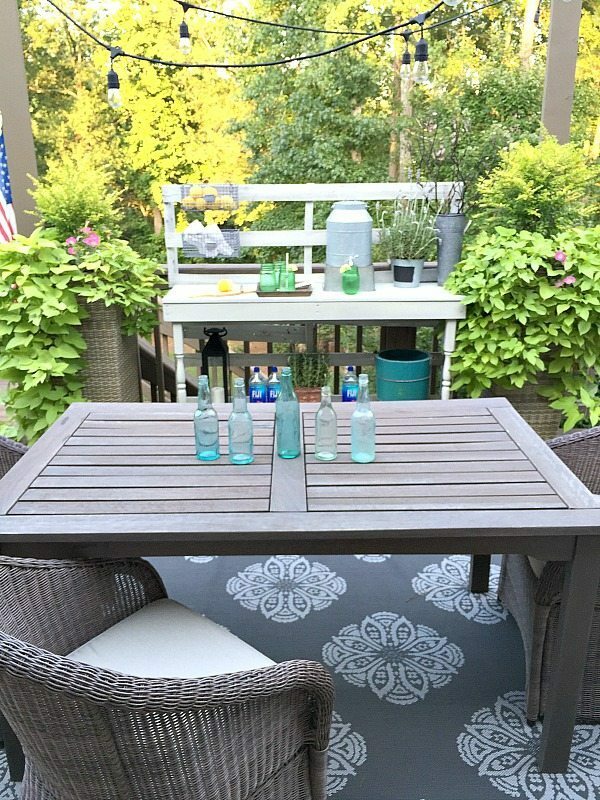 And love that rug under the table. I’ll have to go check out where you bought that from. BTW, I saw those stencils at Walmart too! I never go down that aisle and I was pleasantly surprised at some of the stuff they have. you beat me to it! I made one last year, and I plan on making another one this year, but it’s been too hot! 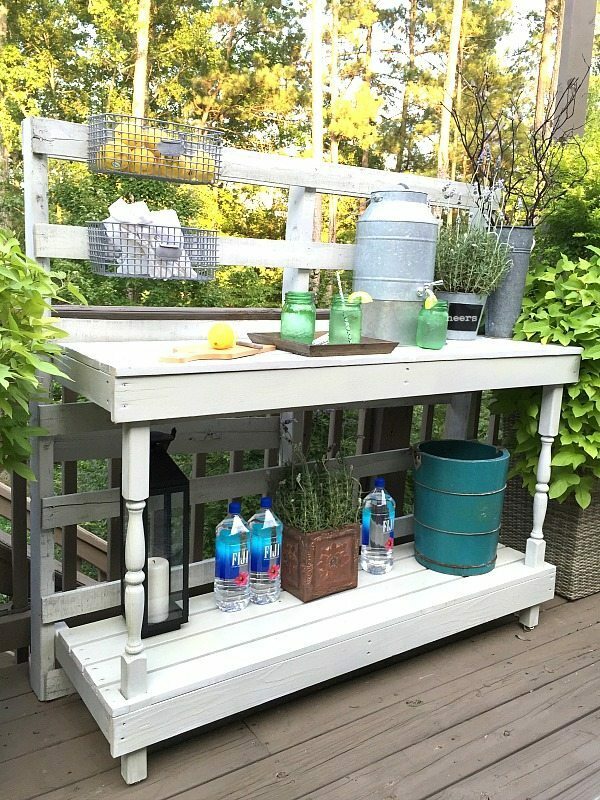 I love your pallet potting bench/beverage station. It’s soooo pretty. 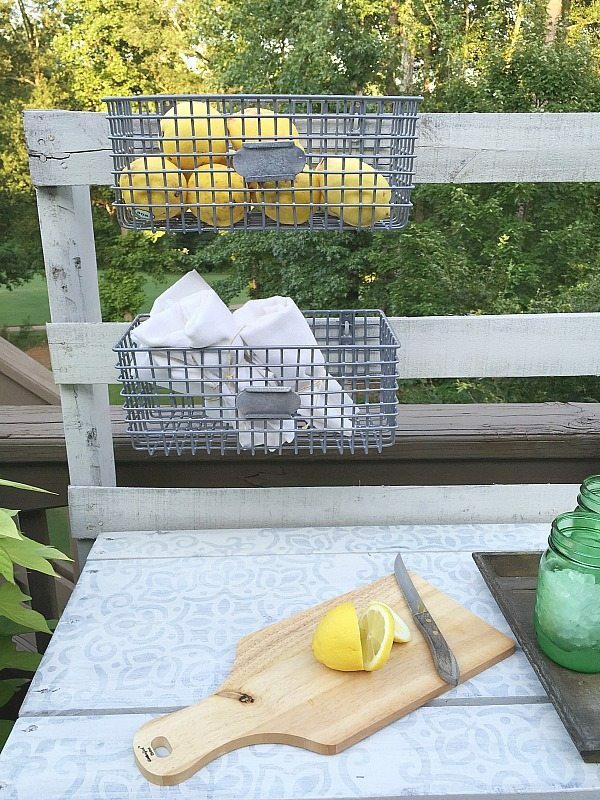 ps love those wire baskets, they’re perfect! Love it Debbie! The stencil is the perfect touch! Wow…you and your projects never disappoint. 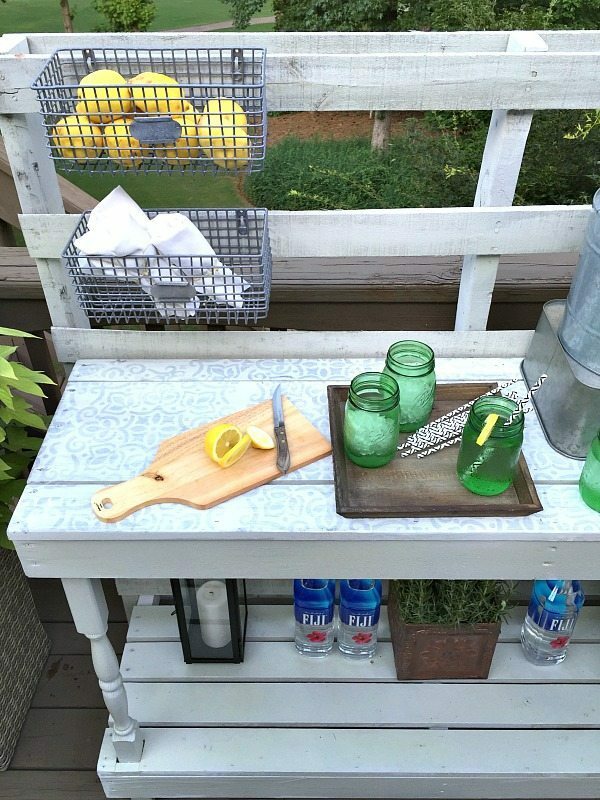 And kudos to barry for knowing you so well 🙂 Love your potting/entertainment table! You knocked it out of the ballpark for sure!